Highland County Commissioners, from left, Gary Abernathy, Jeff Duncan and Terry Britton are shown at Wednesday’s meeting. Following a state inspection on Aug. 1, the Highland County Jail met the requirements for being a compliant jail. The inspection consisted of reviewing documentation, touring selected areas of the jail and meeting with various staff members. The inspector from the Ohio Bureau of Adult Detention found the Highland County Jail facility in compliance, but the subject of jail overcrowding, was addressed in the report. Noting that while the general housing capacity for the Highland County jail is 72, the report stated that there were 87 inmates being housed on the day of the inspection. Health Commissioner Jared Warner gave an update on the status of the county’s single Hepatitis A case, and the continued plans for protection against the disease during next week’s Highland County Fair. Warren said his office was making preparations to keep everyone safe during the fair. Commissioners approved a contract between the county and the city regarding a new fountain to be constructed at the northwest corner of High and Main streets in Hillsboro. Safety and Service Director Mel McKenzie indicated he had a meeting scheduled on the project. McKenzie addressed delays affecting the “pocket park” that will occupy the space where the Colony Theatre once stood. “I got an email from Snider Brick, who are making the paver stones, and they’ve got some problems with their kilns in Georgia and North Carolina, which are delaying shipment to here,” McKenzie said. Other items discussed had to do with a fire alarm that was triggered early Wednesday morning at the Highland County Courthouse. Britton said that even though it was a false alarm, it did reveal a concern not previously addressed. The Knox box is a small wall-mounted safe that stores keys for fire and emergency personnel for after-hours entry if an alarm goes off. Commissioners also entered in a one-year contract with Weller’s and Plug Smart, two companies involved in heating and ventilation maintenance services. Both companies will provide heating, ventilation and air-conditioning maintenance on county buildings starting Sept. 1. The commissioners also approved a trio of resolutions in their Wednesday morning agenda. All three had to do with budgetary line items, enabling commissioners to transfer funds. 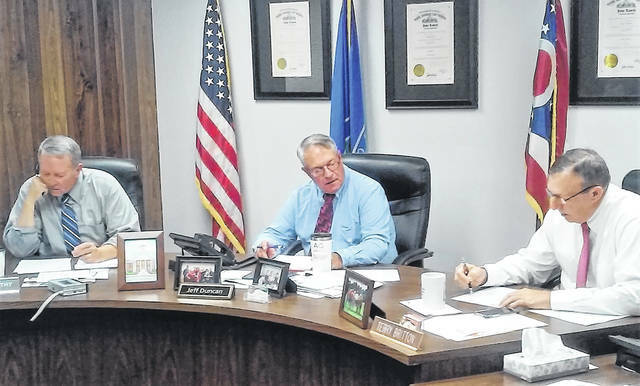 https://www.timesgazette.com/wp-content/uploads/sites/33/2018/08/web1_Commissioners-29-Aug.jpgHighland County Commissioners, from left, Gary Abernathy, Jeff Duncan and Terry Britton are shown at Wednesday’s meeting.